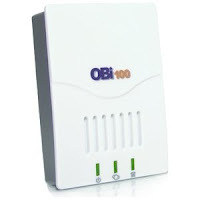 Thanks to the recommendation from a friend of mine, I purchased the OBi100 VoIP Telephone Adapter last week while it was on sale on amazon.com for under $40. This is a cool gizmo that allows Google Voice users to make and receive phone calls for free as long as they have a decent Internet connection. I opted for the free shipping from Amazon.com, so it should be in sometime by the end of the week. I will be sure to post once I get a chance to try it out!